West Indies Vs Australia 13th June 2016 Match Live Score Highlights Winners Results :- The next match of triangular International series is between the Australia and West Indies on June 13 at the Warner Park, Basseterre, St. Kitts. The host will face the World Champions Australia on Monday where West Indies will try to clinch their secon win of the tournamnet, meanwhile Australia will look to top the table by winnning this encounter. Australia has thrased the South Africa in their last encounter by 36 runs on the back of a brillinat century from David Warner, also well supported by the bowlers to clinch the victory. Warner scored 109 in the first inning of that match and then Mitchell Starc & co. destroyed the batting order of South Africa. Faf Du Plessis and Hashim Amla were the lone warrior for South Africa in their run chage. With the help of this win, Australia is only the second team in this tournament who managed to win the two ODIs. On the other side, West Indies has only single win under their belts and would come to this match with the only mattive to win this match. The inform batsman David Warner is likely to miss this match with the thumb injury which is a big blow for the Australia team. Warner has scored 156 runs in this tournament so far. It is expected that Usman Khawaja will open the inning with Aaron Finch and Glenn Maxwell will make his way back into Australia team. Apart from this, Steven Smith would love to go with the same squad in this match. Captain and Khawaja were amongst the runs in the last match which is huge boost for Australia in this tournament. The batting of West Indies is suffering and the likes of Darren Bravo, Denesh Ramdin, Keiron Pollard and Marlon Samuels have to contribute with the bat if they want ro win this important match. The Key for West Indies is Sunil Narine , this off spinner has clinches 8 wickets so far in this tournament and his team will need some magical spell from him in this match like he does in the first match where he clinched 6 wickets against the top quality batting side South Africa. Aaron Finch, Usman Khawaja, Steven Smith(c), George Bailey, Glenn Maxwell, Mitchell Marsh, Matthew Wade(wk), Josh Hazelwood, Mitchell Starc, Adam Zampa, Nathan Lyon. Johnson Charles, Andre Fletcher, Darren Bravo, Marlon Samuels, Keiron Pollard, Denesh Ramdin(wk), Charlos Braithwaite, Jason Holder(c) Sunil Narine, Suleiman Benn, Jerone Taylor. Australia is favourite to win this match and this team have momentum with them and would like to implement their winning momentum into this match to clinch a win to top the table in this tournament. 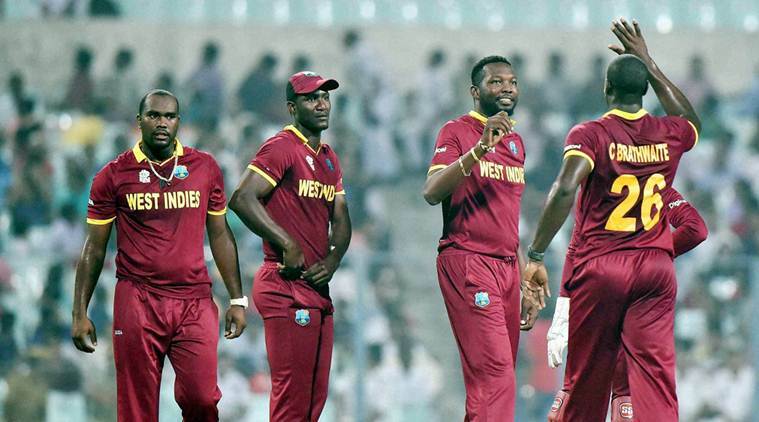 On the other side, no one can underestimate the potential of West Indies team especially when this team has match winners in the form of Sunil Narine, Keiron Pollard, and Charlos Braithwaite. West Indies has thrased the South Africa in the very first match against South Africa and the fans will expect the same performance from their home team on Monday.